i was really excited when i learned that joy wilson was releasing her second cookbook in october. i immediately put it on my christmas gift wish list, then proceed to patiently wait for two months. i was thrilled when i unwrapped this cookbook from ryan's parents at christmas. as soon as i saw the cake on the front cover, i knew it was the cake i wanted for my birthday this year. a thirtieth birthday requires an epic birthday cake, and this cake certainly fits the bill. 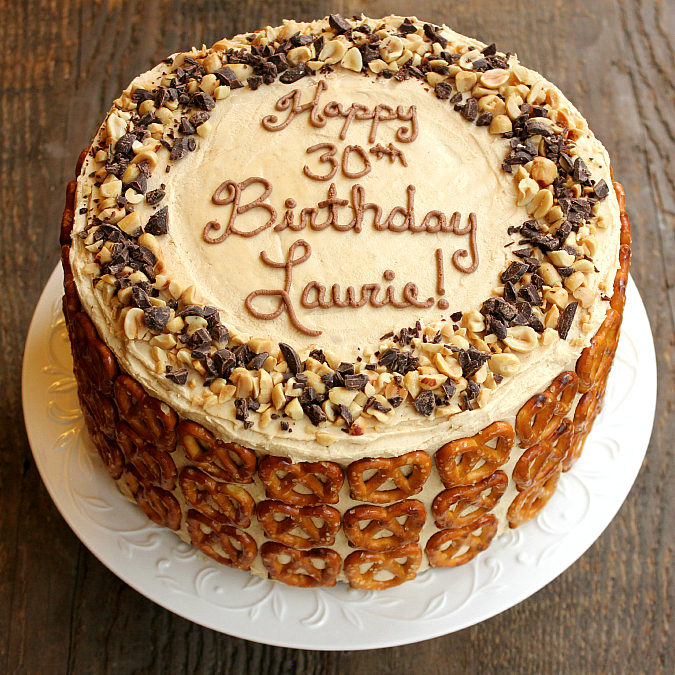 a three-layer chocolate cake with peanut butter frosting, crushed pretzels, and chopped chocolate pieces between each layer. the whole thing is covered in peanut butter frosting, and then then the top is decorated with chopped roasted peanuts and more chopped chocolate pieces. as if that's not enough, the sides of the cake are totally covered in mini pretzel twists. ryan and i made this cake for my birthday celebration this weekend, and it was absolutely delicious. it was the perfect blend of sweet and salty. we have been enjoying leftover slices of cake for dessert each night since then. to make the cake: preheat your oven to 350 degrees F. grease and flour the sides of three 9-inch round baking pans, and line the bottoms of the pans with parchment paper. in the bowl of an electric stand mixer fitted with a paddle attachment, cream the butter. add the sugars and beat until light and fluffy (about 3-4 minutes). add the eggs, one at a time, beating well after each addition. mix in the vanilla. in a separate bowl, sift together the flour, baking powder, baking soda, cocoa powder, and espresso powder. add half of the flour mixture and beat until incorporated. with the mixer on low, add the buttermilk in a slow stream and beat until thoroughly combined. add the remaining flour mixture and beat just until combined. divide the batter among the 3 pans. bake for 25 minutes, or until a toothpick inserted in the center of the cake comes out clean. once baked, allow the cakes to cool in the pans for 15 minutes before removing the cakes from the pans and allowing them to cool completely on a wire cooling rack. to make the frosting: in the bowl of an electric stand mixer fitted with a whisk attachment, cream the butter. add the peanut butter and and vanilla, then beat well until combined. add 2 cups of the powdered sugar and beat until combined. add another 2 cups of sugar along with 3 tablespoons of cream. beat well until combined. add the remaining 2 cups of sugar and beat until the frosting reaches your desired consistency. to assemble the cake: place one layer of the cake on a cake stand and cover it in frosting. sprinkle half of the crushed pretzels on top of the frosting along with one third of the chopped chocolate. place the second layer of the cake on top of the first and repeat. 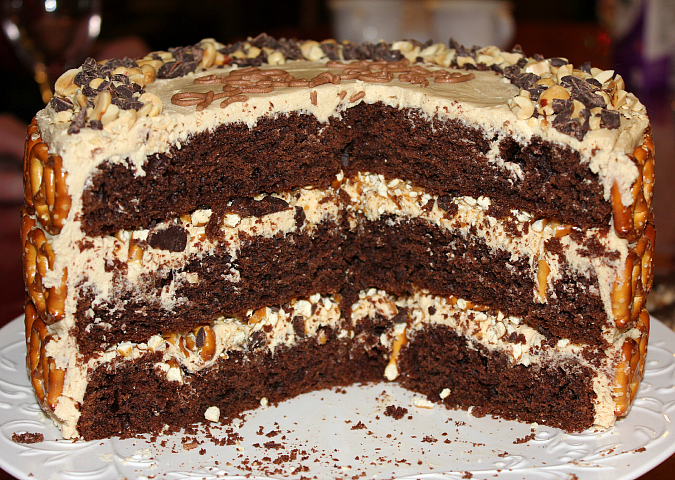 place the third layer of the cake on top and cover the entire cake with an even smooth layer of frosting. sprinkle the remaining chopped chocolate around the top rim of the cake along with the chopped peanuts. press the mini pretzel twists into the sides of the cake. 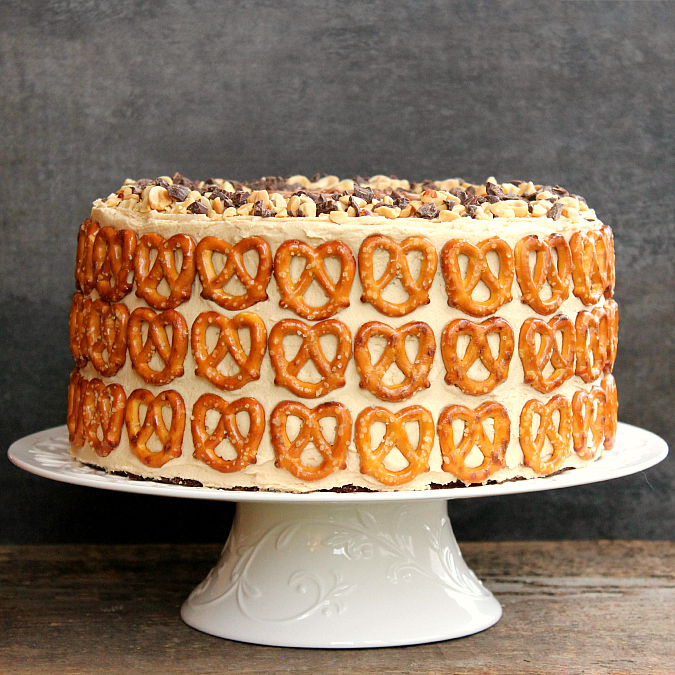 note: a 3-layer 9-inch round cake will accommodate 21 columns of 3 pretzels. if you stack three pretzels on top of each other in a straight vertical line, it will make it easy to slice the cake, rather than offsetting each row of pretzels. That was a very tasty cake and good looking too. I like how easy you made it to cut by lining up the pretzels. 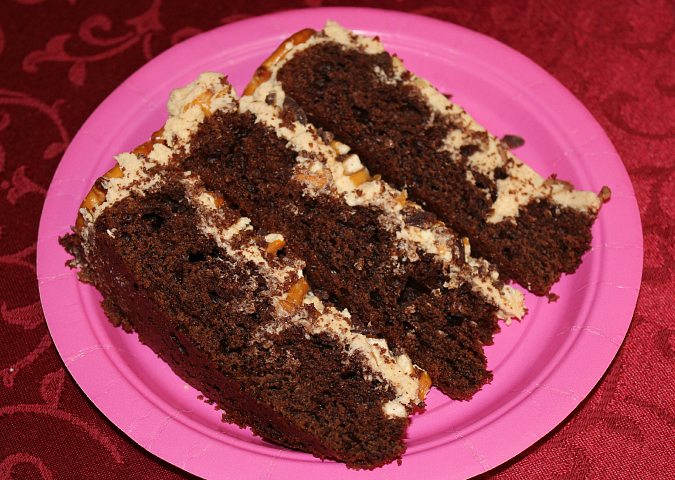 Chocolate and peanut butter is always a winning combination. This looks amazing! And it's so pretty! I want to make this for my friends 21st birthday! How did you do the icing for the written part?! This cake looks fantastic. I can't wait to try it. Do the pretzels get soggy in the middle layers?